Following the day-to-day happenings here in Guadalajara and around Mexico can be somewhat discouraging. As a foreigner I watch, listen and observe. Many things I can not, for the life of me, wrap my head around. However, watching the Mexican people deal with these things boggles my mind. To be honest, I don't know if I should be amazed, and take my hat off, or shocked & discouraged. Since I have never had to live with these things, as part of my daily life, with no other option, it is hard to say which is the right response, or if there even is one. I have found that the typical response to negative things here in Mexico is to laugh at them, to mock them, to ridicule them and make ongoing jokes about them. 1. Donald Trump: I don't know if his presidential speech got as much traffic at home as it did here. But WOW! To encapsulate his comments, he basically said that the U.S. had problems with its southern boarder, with all the Mexican murderers and rapists it allows through. You may have seen the fallout from that speech, as people began breaking ties with Trump. My response to that speech was somewhat more intolerant than my Mexican friends. 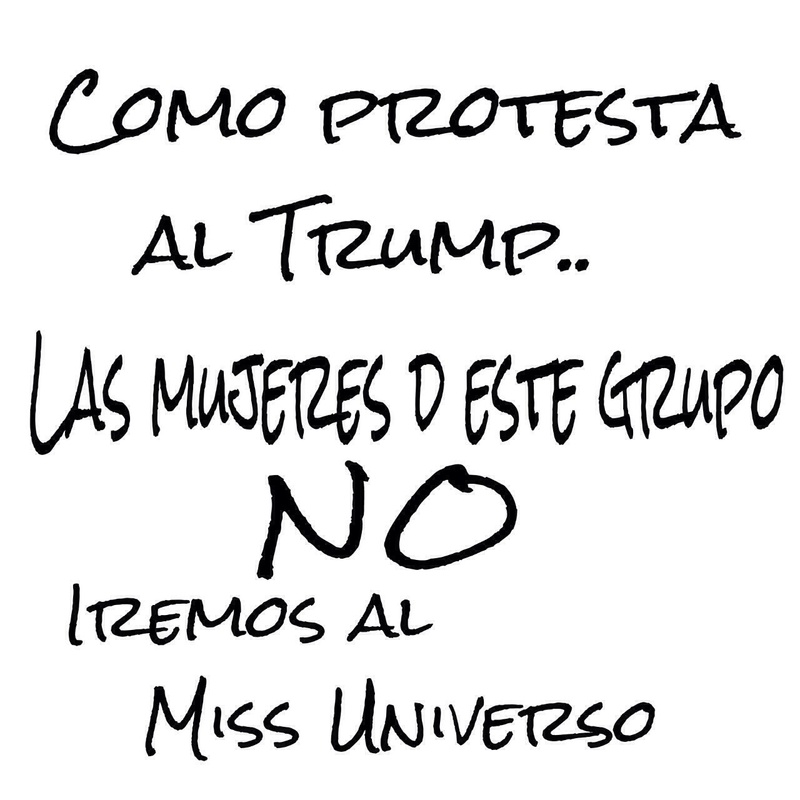 group (WhatsApp) will not go to Miss Universe! 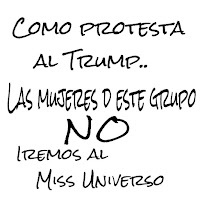 This says: We're not going! but he works for me! While I was angered by Trumps comments, offended for my Mexican friends, they just laughed. Trump jokes abound. While Mexicans recognise the border problem, and they even acknowledge that there is one; there was outrage at his racist comments. To imply that all Mexicans are rapists and murderers is outrageous. That's a racist generalisation that's just not true! I happen to have some wonderful and beautiful Mexican friends; too bad Trump hasn't had the privilege of meeting them. 2. 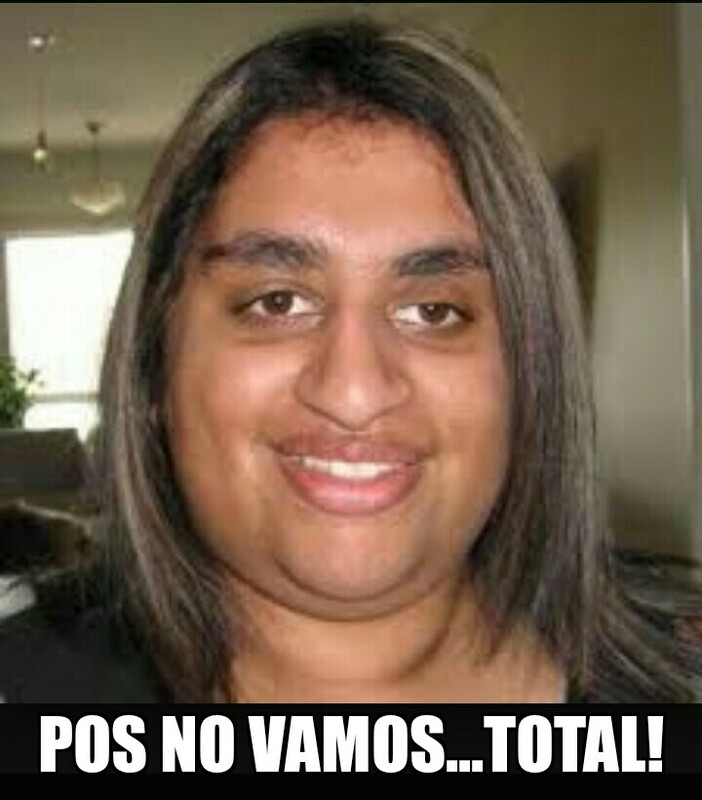 Chapo Guzman. The most recent event has been the famous escape of the biggest Mexican drug lord, from a maximum security prison; his second time escaping! This is getting big press coverage, worldwide. My Facebook wall is full of the mockery of the whole thing. Translation: If you love Chapo, let him go, if he returns, he's yours, if not, he never was. I will not even make a comment about this - the news media is doing a pretty good job of questioning this whole event, and the 'official' story about how he 'escaped'. 3. President Enrique Peña Nieto. The biggest, and most confusing to me, is the way they talk about their president. He gets ridiculed for everything. They openly mock and run him down. Never is there a day that he doesn't get bad press for something he said or did. Some times it might even look like he deserves the scorn, but I don't know if we Canadians would respond with mockery to our Prime Minister; but rather with outrage and anger? 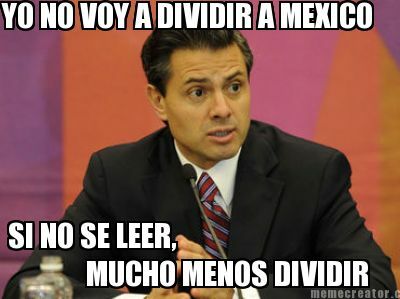 I'm not going to divide Mexico, I don't even know how to read let alone divide (math). "Run, Trump, Run" ... "What was it you said about Mexicans?" 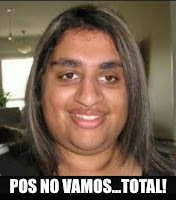 ... "Chapo... I was kidding!"